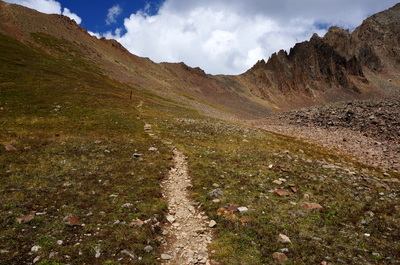 Directions: Getting there is half the adventure. 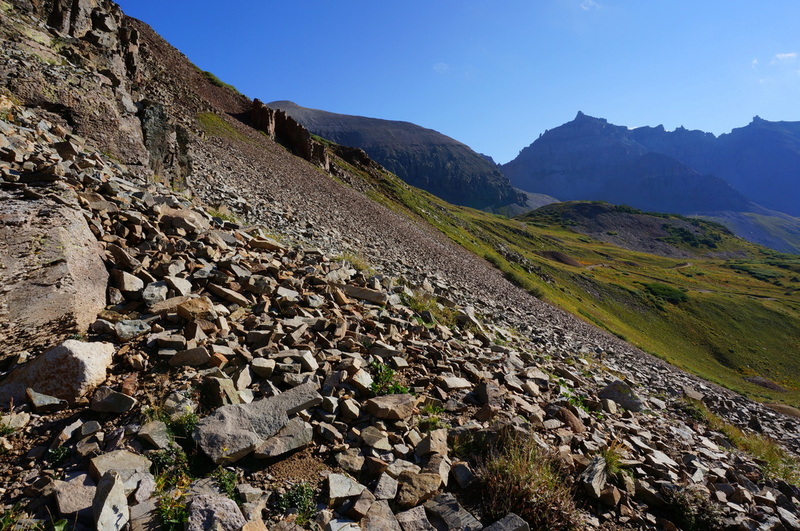 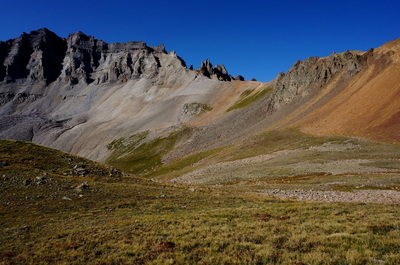 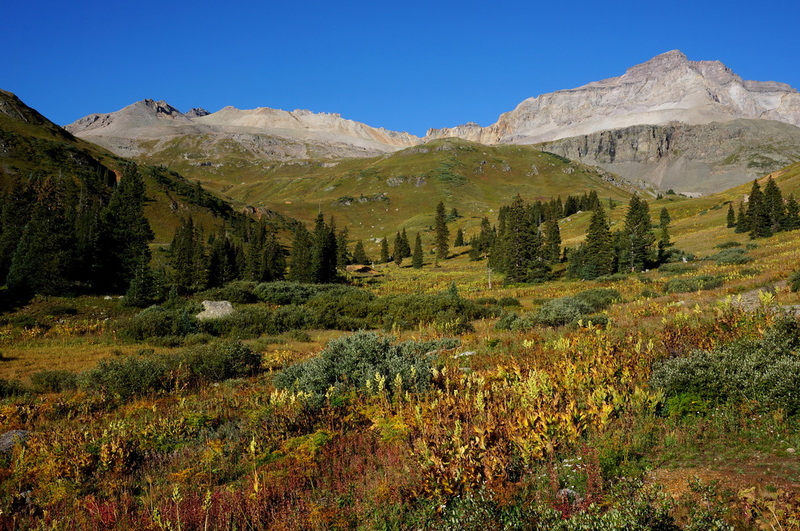 Your driving destination is an outhouse in Yankee Boy Basin, this serves as the non-Jeep trailhead. If you have high clearance 4 wheel drive you can try to make it to the upper trailhead, making for a trip of a few less miles. 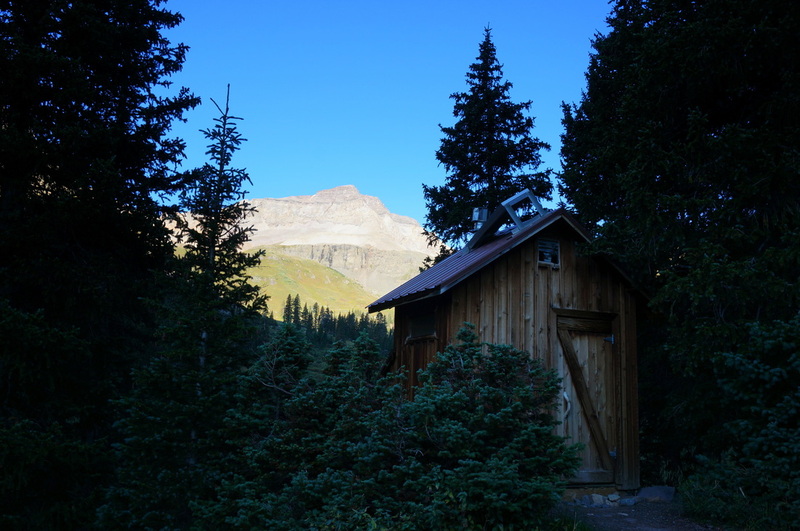 I drive a 2010 Subaru Forester and it handled great on the road, but I thought it safer to walk from the outhouse. 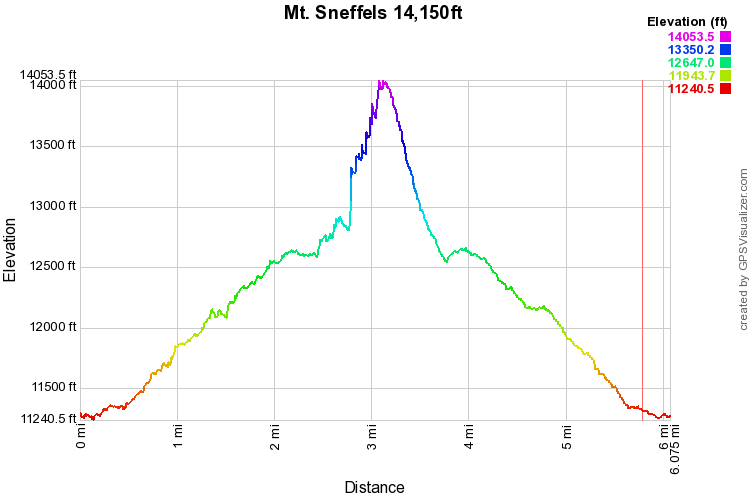 It all depends on your comfort level. 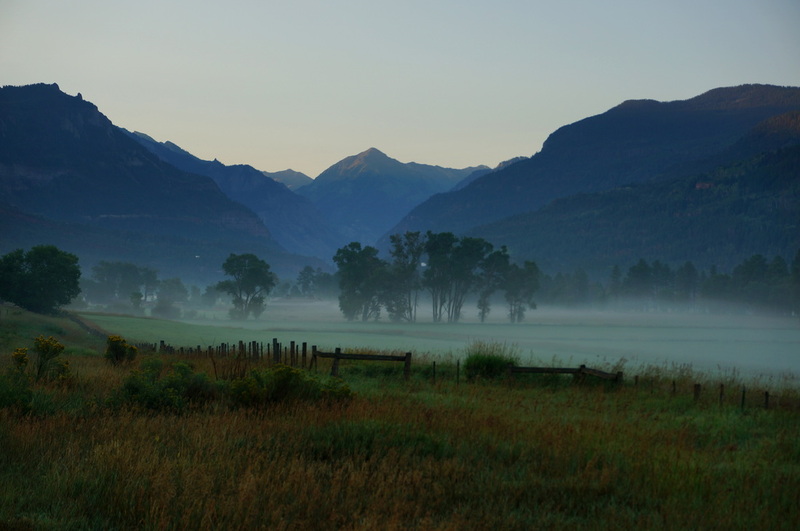 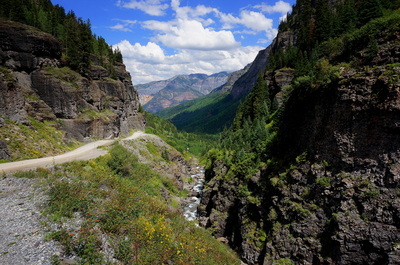 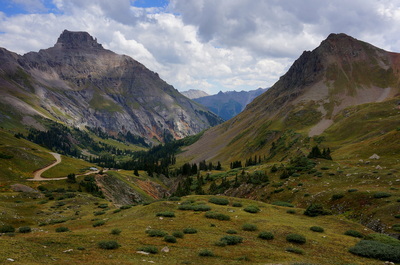 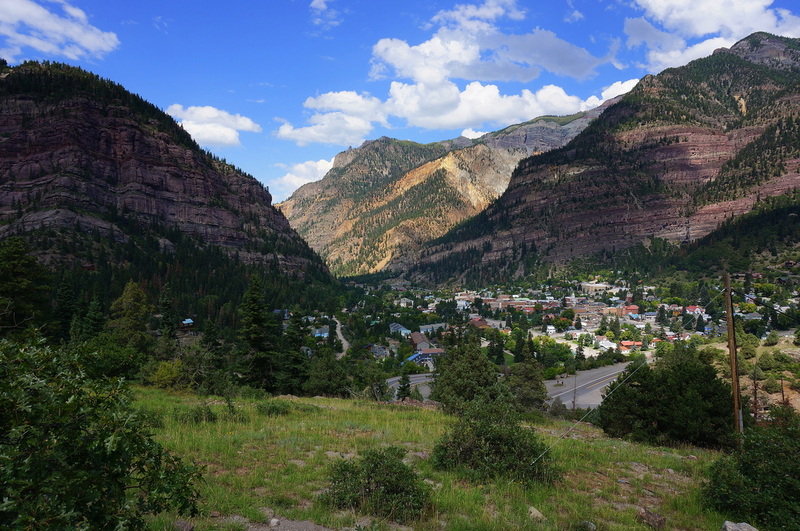 From Ouray, head south out of town and turn right on Camp Bird Road. 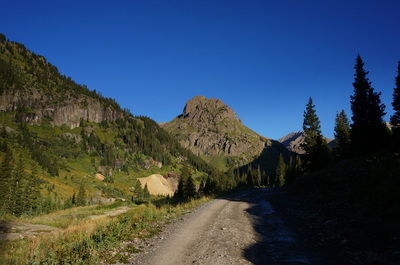 There are various active mines on this road, so the road is fairly well maintained. Stay right at the two turn offs for the mines. After the 2nd mine, the road gets noticeably worse. 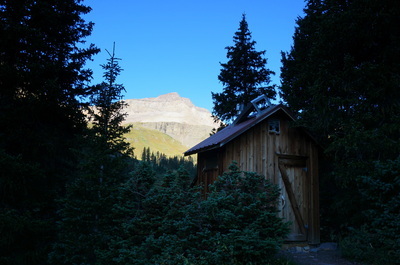 Stay with it until you get to the outhouse. 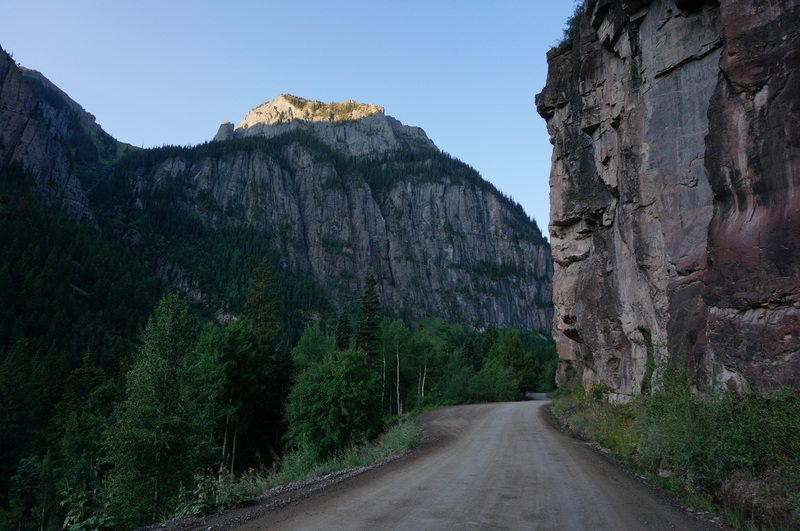 This road is absolutely beautiful and for the most part totally do-able, don't let it scare you off. 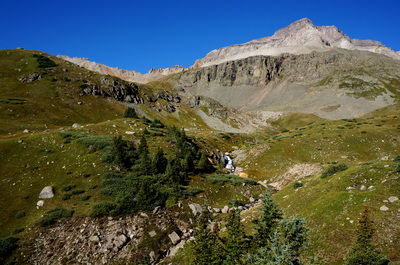 From the outhouse travel up the dirt road, following well marked signs. 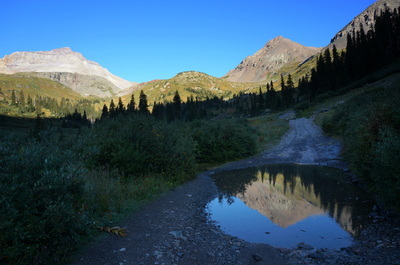 Soon you will leave the road on a single track to Wright's Lake. At Wright's lake rejoin the road for a short time until another trail sign points you to the single track heading up to Blue Lakes Pass. 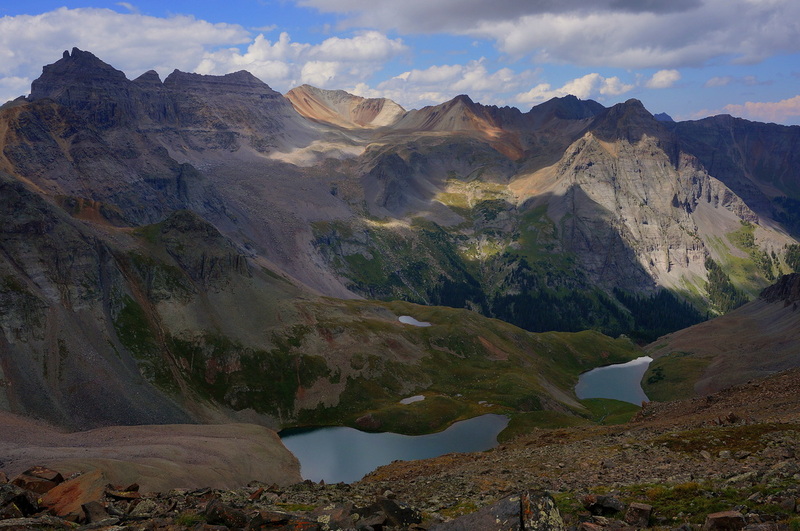 I can't even describe how incredible this basin is... You need John Muir to describe it, not me. After 2 miles or so you'll come to a trail junction, stay straight to go to Blue Lakes Pass, turn right for the Summit push. 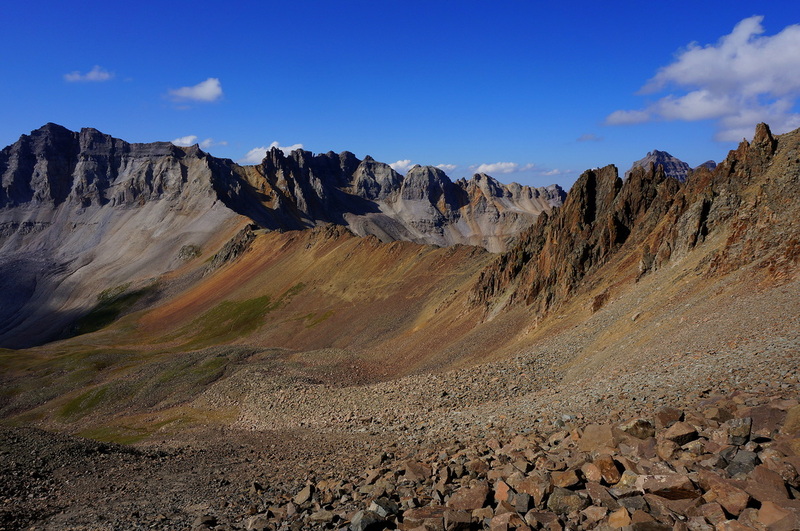 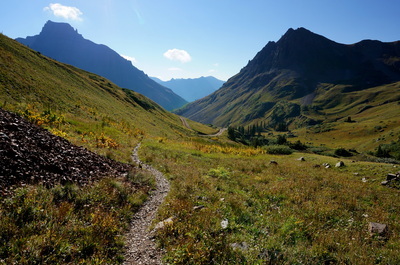 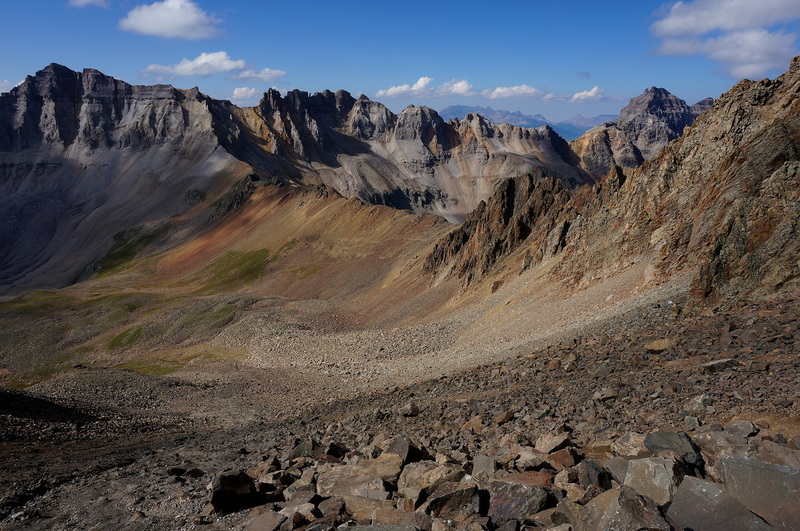 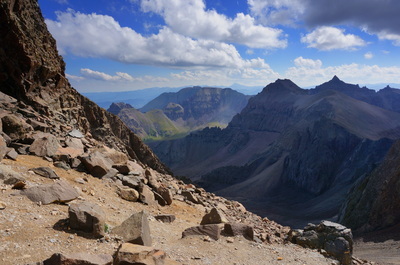 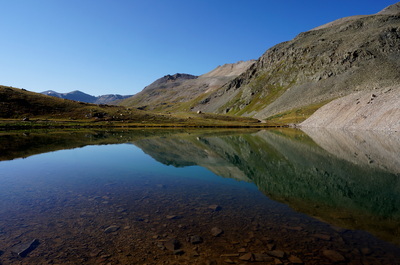 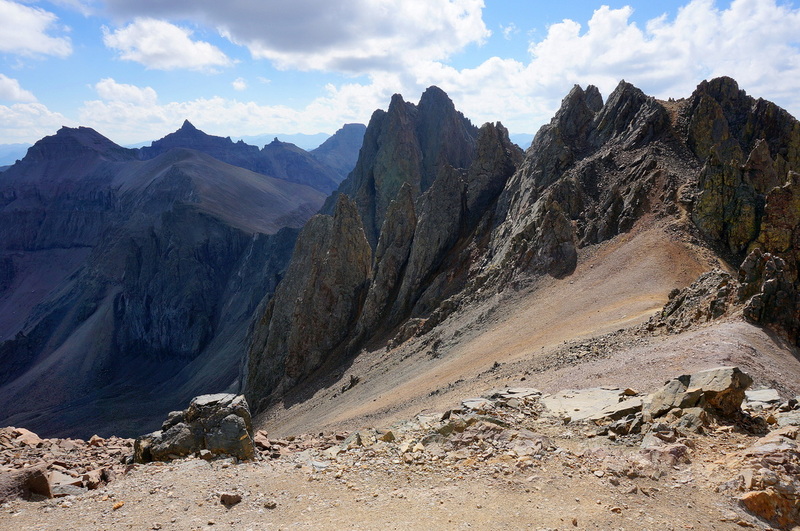 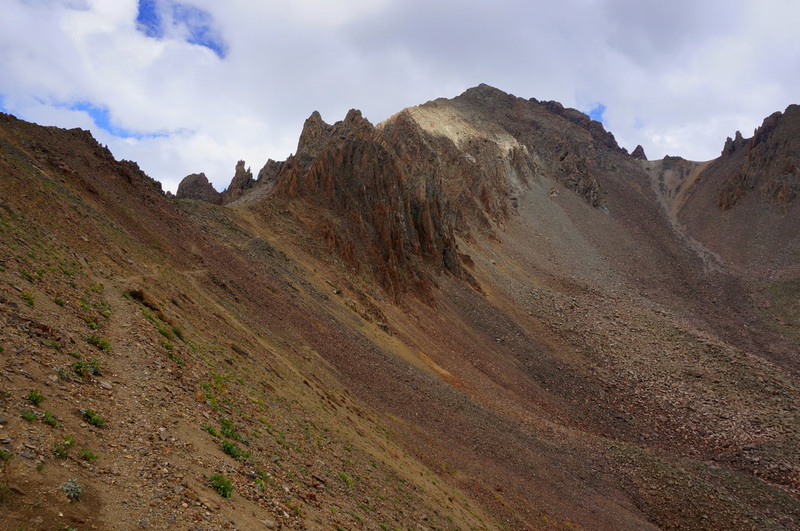 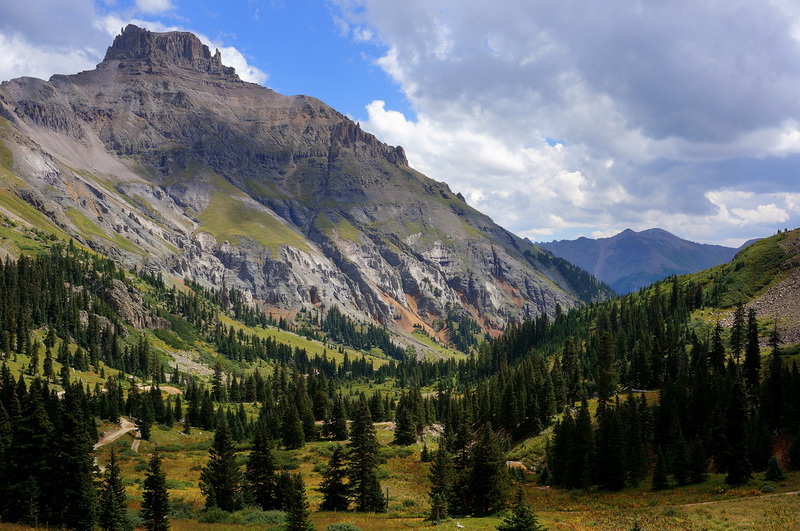 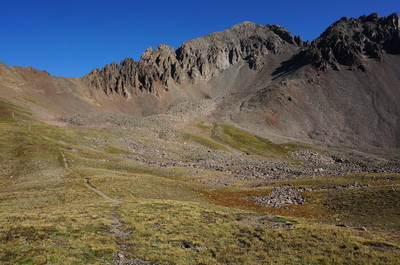 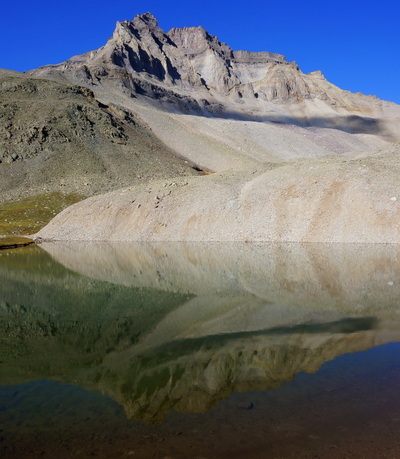 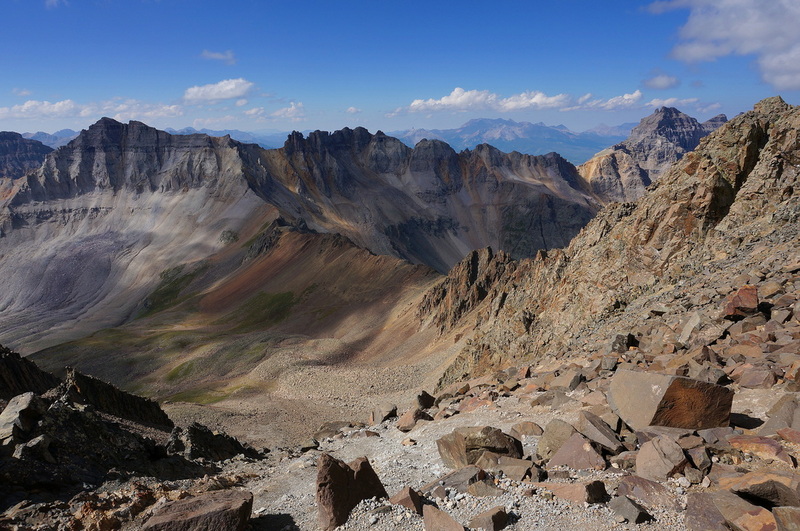 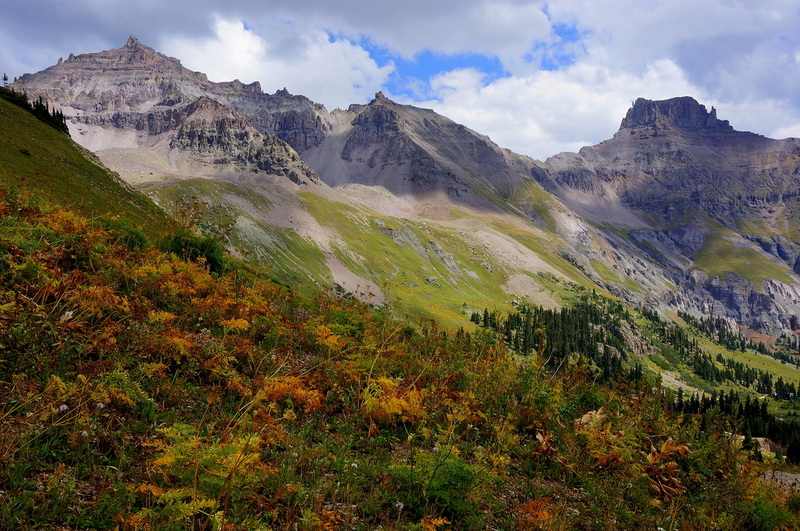 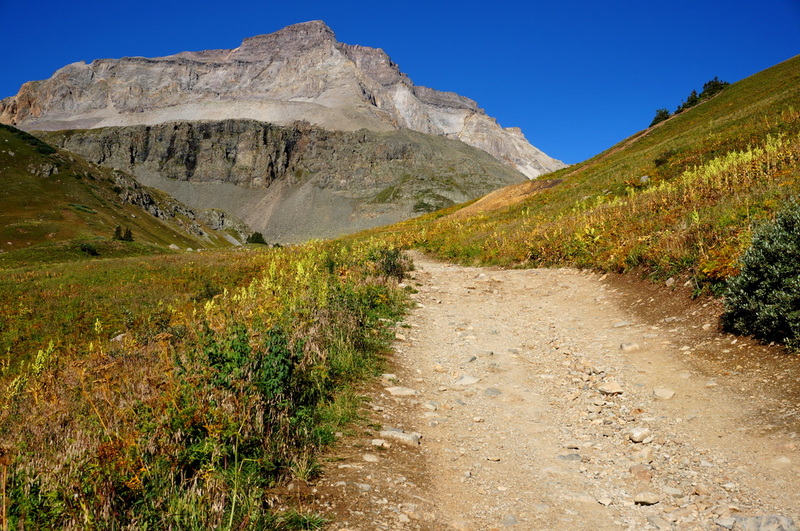 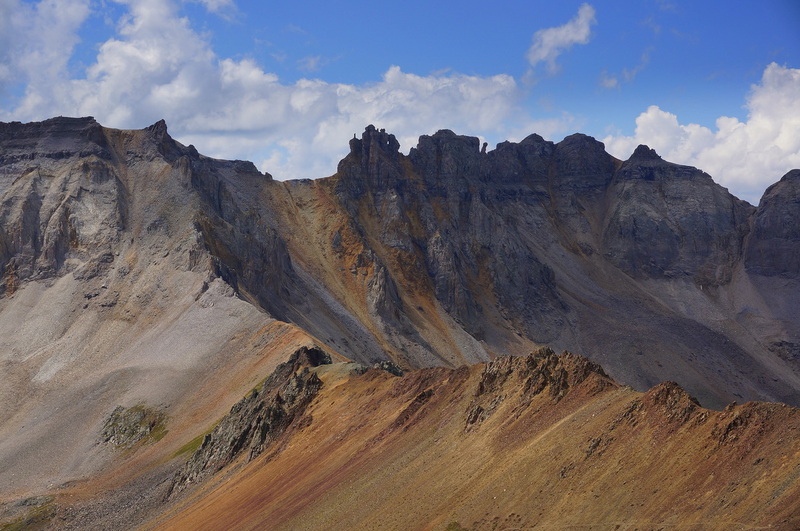 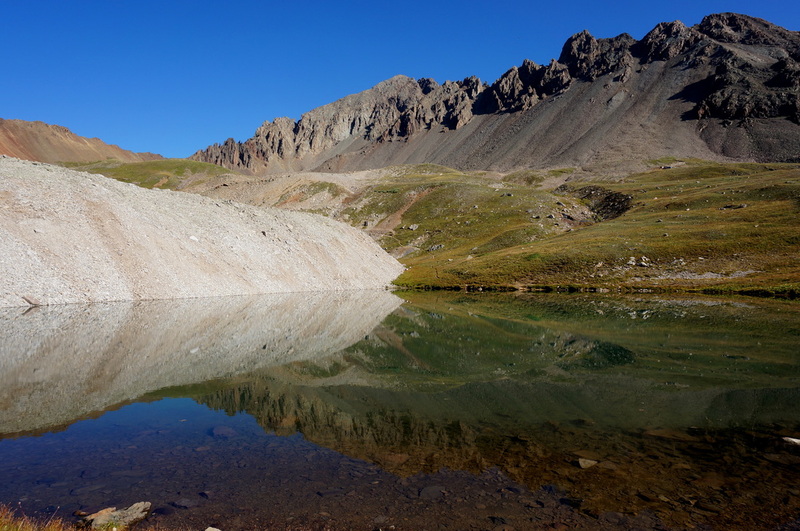 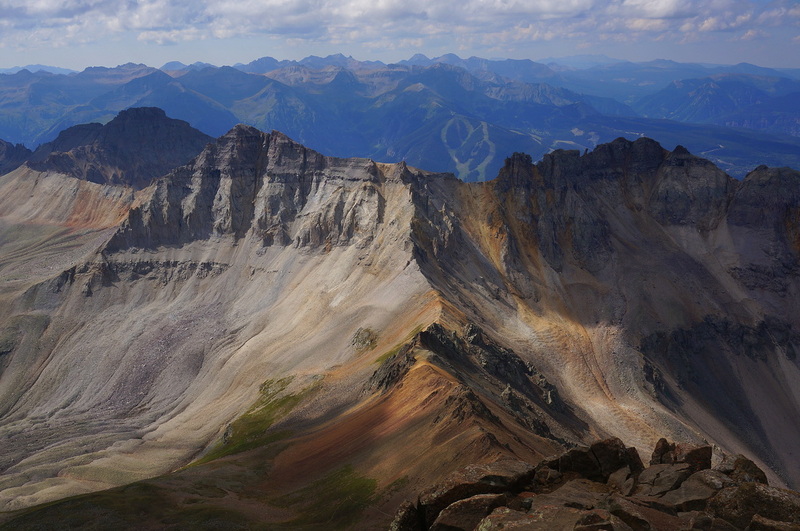 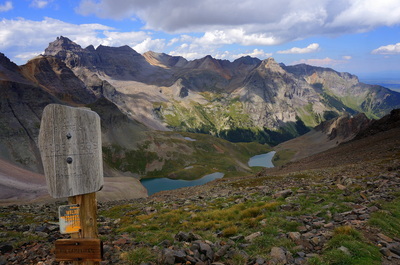 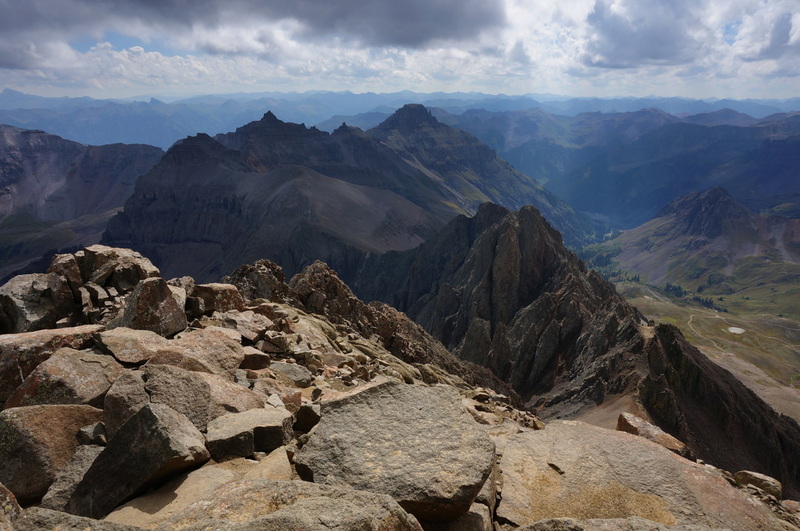 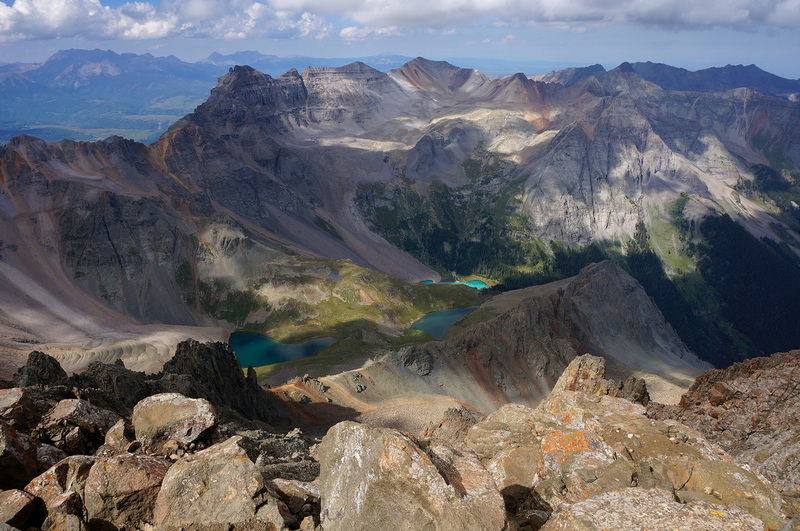 Here is where you should evaluate the conditions, weather, your energy level, supplies, etc... Blue Lakes Pass is a worthy destination and you should feel proud for getting there, but if the weather is good and you feel good, go for the summit. 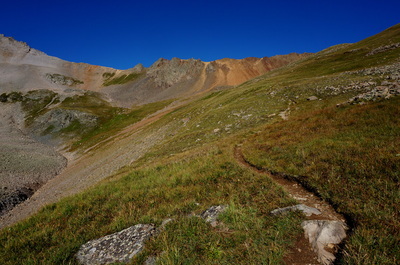 The trail to the summit, is hard, but 150% worth it. 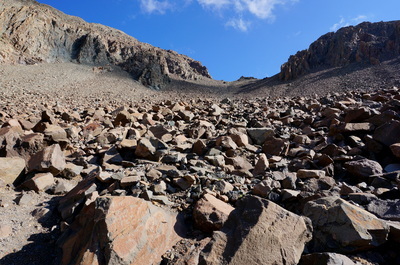 First you boulder hop, then you start ascending the slope. This is a grind, 2 steps up, one step back on loose ground. 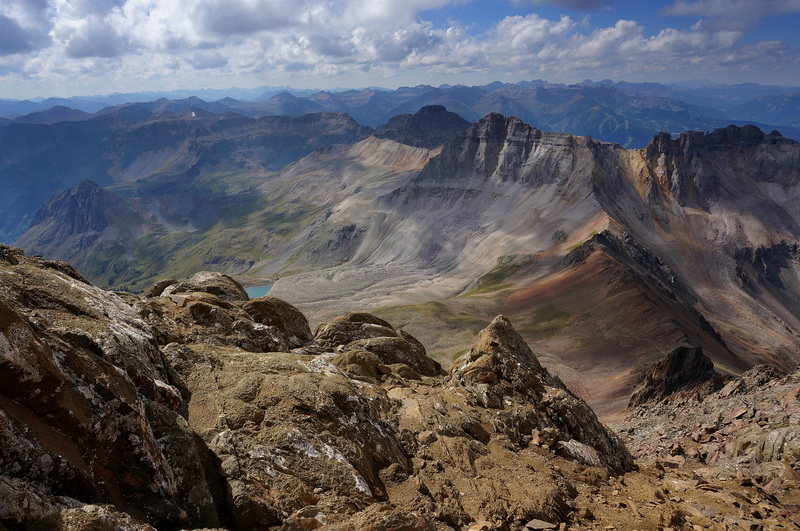 Keep your eye on the views and your feet, take it slow, and you'll make it. Once up on the saddle you will feel like you've entered another world, Oz maybe... 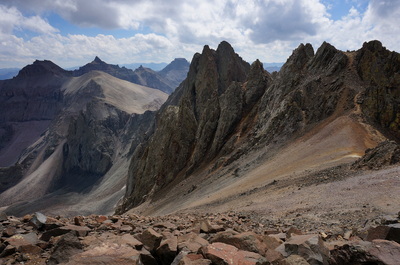 The views of the surrounding peaks and spires is amazing. Once you've rested, turn your attention to the Col. 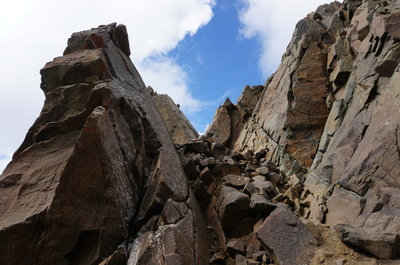 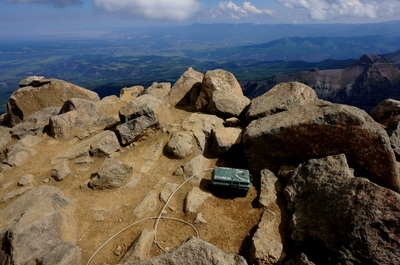 This is a narrow, rocky column leading up to the summit, again take it slow and steady. 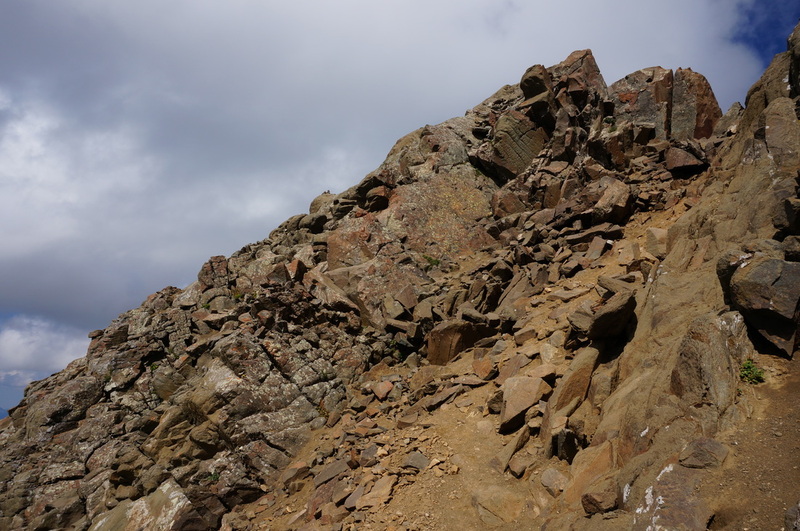 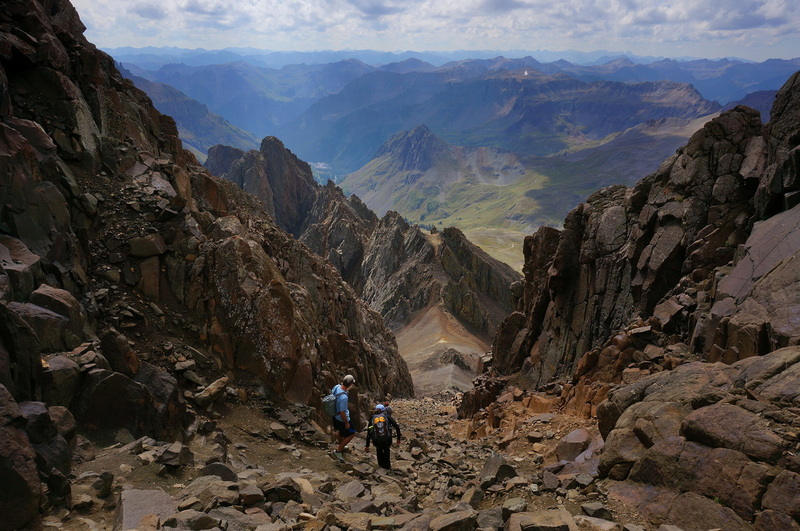 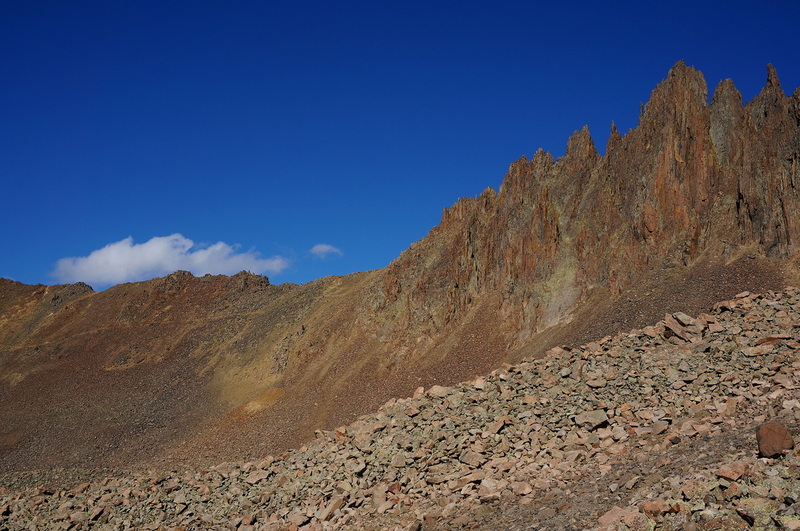 Near the top of the col, look to the left for the rock with the notch, climb through it and you're on the homestretch, scramble (carefully) up to the summit, you'll know the summit when you are there, there are no false summits here. 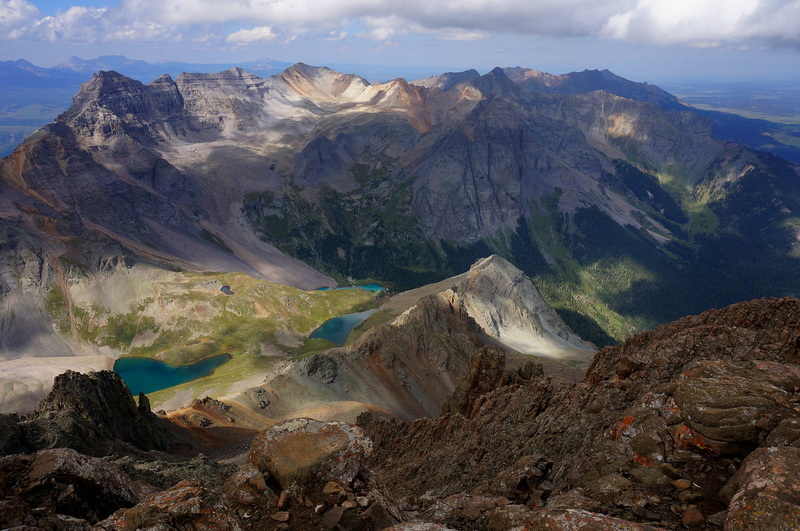 Take a few deep breaths, relax, and enjoy...this view is AMAZING. 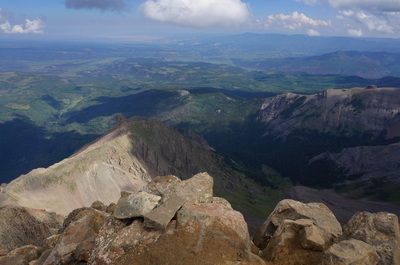 You are looking down on Yankee Boy, down on the Telluride ski resort, down on everything. 360 degrees of pure Colorado amazement. 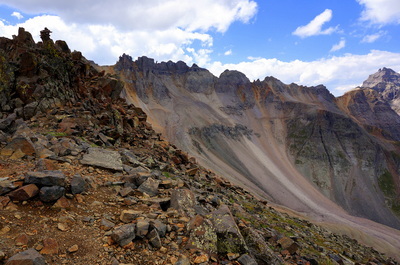 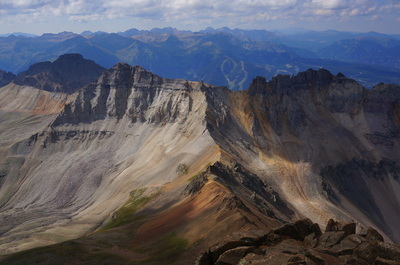 At some point drag yourself off the summit and retrace your steps being even more careful then you were on the way up. Once back at the trail junction, and if you have the time and energy, go up to Blue Lakes Pass, it's fantastic! 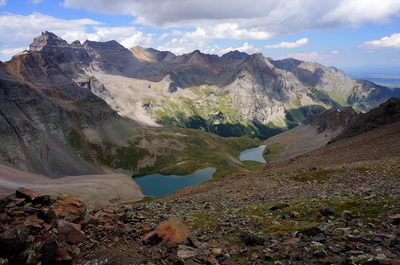 Views that rival the summit and it's not that much more effort... Then, take your burning quads into town and soak in the hot springs for awhile. As far as dayhikes go, this is one of my top 5.